I’d like to thank Plant Based on a Budget contributor Margaret Chapman for agreeing to do this interview with me. 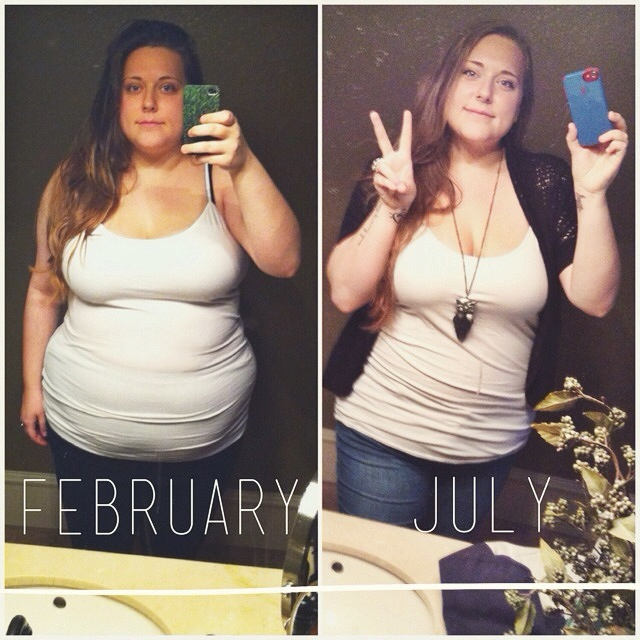 I am so inspired by her dedication to taking control of her health, and I hope you find inspiration in her story as well. Please thank her for speaking so candidly about something personal to her by leaving words of encouragement. Can you tell us about your diet and health prior to taking on a plant based diet? Before going vegan, I was basically in a situation very similar to Joe Cross (from Fat, Sick & Nearly Dead). I was at my highest weight of 300 pounds, I suffered from Hypothyroidism, acne, constant fatigue and overall I was a very angry/bitter person. I hated my life, I was mad all the time and I blamed everyone for the choices I was making for myself in terms of food/health. My diet consisted of fast food, and when I say consisted of – what I really mean is 2-3 times a day, every single day throughout my entire teenage life. I snacked on junk foods (i.e. chips, candy, soda) and I never touched a glass of water. My view on “health” was nonexistent. I ate what I wanted without the slightest bit of concern for myself. What inspired you to change your dietary preferences? In December 2012, I finally had enough. I went to a family gathering and couldn’t help but wallow in my own self-pity the entire night. I felt sick, I was overweight and uncomfortable in my clothes and my own skin. I was an adult that couldn’t take responsibility for myself and I came to the conclusion that enough was enough. I was truly sick and tired of being so sick and tired. I wanted to make a change and prove to myself my life didn’t have to continue in this path. I knew I had the power to change it, I just needed help learning how. I reached out to vegans online, on Instagram to be specific. I was always fascinated by the lovely food shots people would post and being able to see beautiful food that was making these people happy made me want to try and see if I could feel the same way. I started by watching documentaries on plant-based diets (Food Matters, Earthlings, Forks Over Knifes & Vegucated), as well as the farming/dairy industry as a whole. I think after just two I was so shocked and disgusted, I couldn’t stop crying. I knew being a carnivore wasn’t right for me. I felt morally defeated and physically ill at the thought of everything I spent my life eating. Especially after growing up with so many animals and having a huge heart for all living creatures. I just finally made the connection and realized what my actions resulted in. I blame myself for not being properly educated, but I also feel as though I was at a disservice by not being taught this basic aspect of food. I had no education on food, health or where and what meat came from. It’s just so easy growing up going to a grocery store and buying a nice and neat slab of meat, wrapped in plastic and having no idea what had to happen for it to get there and why. Since becoming vegan, what changes in your health have occurred? I became vegan January 28th, 2013. Since then I’ve experienced what I now deem true health. I no longer suffer from adult acne, in fact my skin glows. I also no longer take a synthetic prescription for my Hypothyroidism. I’ve since lost over 60 pounds and I finally feel like myself. My energy is through the roof, I’m happy and much more optimistic about myself and life in general. I no longer suffer some sever insomnia and I actually wake up at a normal time. All of these things individually might not seem like much, but as a whole it’s changed everything for me. I live my life knowing I’m eating the best I can financially and reaping all the benefits physically, mentally and emotionally. My mind was always so clouded and unsure but changing my lifestyle has brought on so much clarity and peace. I can’t imagine ever going back to the life I was living before. And have you learned anything about food and agriculture that you didn’t know already? Very much so. I’m not a genius on the topic but I’d like to think I now understand the truth behind our food industry. You can only trust yourself to make your own food/health decisions. Relying on false/misleading labels without understanding the origin of ingredients and/or supporting companies that only want to profit from you by exploiting you is just wrong. I no longer buy something without reading every ingredient listed on the label and if it’s clearly full of gmos, I just walk away. I don’t get played a fool. What was your biggest obstacle in becoming vegan and how did you overcome it? To be honest, I come from a family that prides itself on BBQ. I was raised eating meat, it was practically a sport in my family and still is. I was never worried about my transition, but the perception my family would have on me for changing. I didn’t want to disappoint them by being different and having a voice for animals. But, to my surprise, my family and parents specifically were very encouraging to my lifestyle change. I actually inspired my brother and sister-in-law to change as well and my father no longer eats red meat or buys non-organic foods. So I’m proud I’m being heard while still being respected for my opinions. What are some budget-friendly resources you would recommend for those hoping to become healthier? Aside from the obvious, PlantBasedOnABudget.com. I’d have to say doing your research on where you live and looking for a local CSA, farmers market or simply having a good relationship with your preferred grocery store is vital to aiding in your success. My local store (Sprouts Farmers Market) offers bulk/case discounting and runs double ad wednesdays. So I can get fresh, mostly local produce for a fraction of the price. I also always plan ahead by prepping meals in advance and/or making my favorite meals in bulk when I have the time. I like buying what’s on sale and when I can getting a bit extra to hold me over to the next sale. You can also always save a bit by buying over ripen fruits, asking for a discount and freezing it for smoothies. So I focus on buying organic, in bulk when it’s on sale and getting a bulk discount to cut costs and save on what I love. Your journey to healthy, compassionate living is very inspiring, do you have any advice for people struggling with taking control of their own health? First off, I can 100% relate to the struggles some of you may be facing. I spent a solid third of my life fixating on my weight, eating garbage foods and feeling terrible. So if that sounds anything like you, you have to decide what’s in your best interest. Do you want to continue living this way? Or are you ready to cut the crap and change? Ultimately it’s a decision for you and you alone. I personally was just too tired to keep up that way, I had to change before I ate myself to an early grave. I envisioned a family I have yet to build and enjoy, living long enough to watch my future children grow up and I wanted more from myself. I have too many dreams not to make something of myself. If you need a push, the obvious answer is definitely educating yourself on a plant-based diet. Also finding a group of like-minded people to help support and motivate you. I was, like I mentioned above, totally and completely unaware of my actions in the bigger picture of things. My diet before ended lives of innocent animals, which to me now is so selfish and insensitive. I have no right deciding the fate of those creatures and supporting their slaughter. I couldn’t stand for that or live with myself anymore knowing I blindly supported that because I put my “needs” first. When you take the time to put your own life in perspective, is it really worth it? When you come to terms with knowing you could do better and not only feel better but live your life as intended, full of health and eliminating excessive doctor visits and perception drugs. You gain a sense of clarity eating pure, whole foods. That alone is worth everything to me.